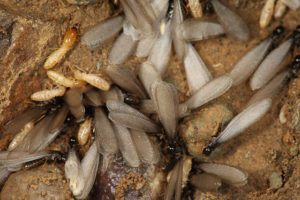 Subterranean termite colonies are established by winged reproductive termites, which usually appear in the spring. Both the male and female reproductive termites feed on wood, tend to the eggs, and build the initial nest. The presence of swarmers is a good sign and insinuation that a well-established colony is in the structure and/or its immediate vicinity. For effective termite control, it is important to begin with a thorough inspection to determine the extent of the infestation, the points of entry into the structure, moisture problems and other contributing factors. The next step is to be presented with the development of a plan for control. Since termite control is extremely difficult, it is necessary to contact a pest control company to eliminate this proble.